When pipes freeze or burst, the water damage that happens can be quickly addressed by SERVPRO of Plymouth/Long Lake/Medina. When extreme weather happens, especially cold temperatures, property is at risk to all manner of damage. Frozen pipes, pipe breaks, water leaking, loss of heating or water, and more. Any of these forms of damage can be addressed by SERVPRO. Water related damage is one of the most common forms of damage during extreme cold temperatures. Exterior pipes can freeze, water lines can burst from freezing, and water may leak out of clogged lines. When these cold weather events happen in the dead of winter SERVPRO of Plymouth/Long Lake/Medina prepares our staff for a rise in calls, as well as calls at all hours. When pipes freeze or burst and you need a professional response quickly, call SERVPRO of Plymouth/Long Lake/Medina at 763-557-7323. Did you unpack holiday decorations and find mold? Call SERVPRO of Plymouth / Long Lake / Medina. If you find mold in your home or office, call the professionals at SERVPRO of Plymouth / Long Lake / Medina to handle the situation. As the holidays approach and you go searching for last year’s decorations you may uncover a patch of mold that has developed. Dark corners of the basement or sections of the attic are common areas to find mold. 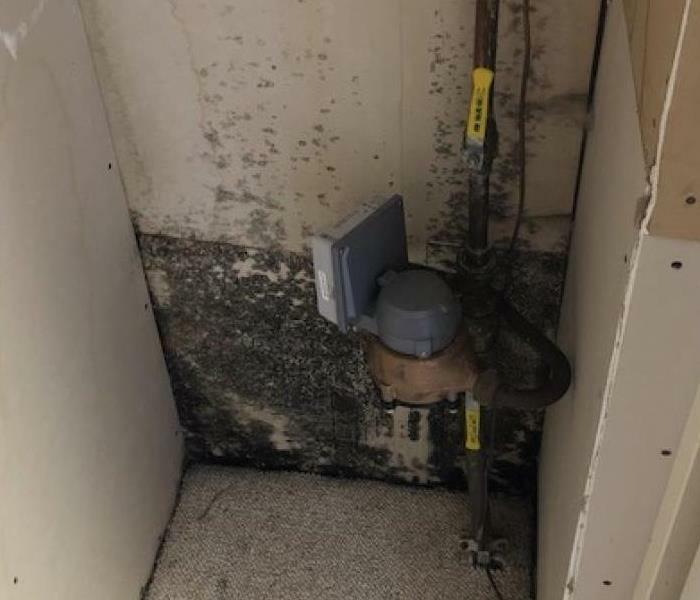 Don’t try to clean or wipe away the mold yourself, SERVPRO of Plymouth / Long Lake / Medina can help mitigate the situation. Locate the source of the mold. Is there a persistent drip or water source in a basement or attic? If so, that needs to be dealt with. A trained SERVPRO technician will evaluate the mold and provide a recommendation on the next steps. Depending on the extent of mold spores, we will typically provide an air scrubber and contain the space to prevent spores from becoming air-born and contaminate the remainder of the property while mitigation takes place. SERVPRO of Plymouth / Long Lake / Medina will arrange for the proper disposal of all mold, cleaning and decontamination. If mold is found in your home or basement, call SERVPRO of Plymouth / Long Lake / Medina to help you 763-557-7323. When water is in your basement, SERVPRO of Plymouth / Long Lake / Medina can help. No matter how it ends up in your house, when water arrives, it needs to be handled quickly and accurately. One of the most common water damage events in residential homes is water in the basement or lower level of a home. Water typically enters from a failed sump pump or rushes in following a heavy rain storm. If you find a puddle of water or a foot of standing water in your home, the situation needs to be handled properly. Safety is one of the first things to be aware. Do not walk into standing water, especially in a home, basement or other area of the home, there’s no telling if electricity is active. This is where the knowledge and experience of the SERVPRO team can help. Our team regularly handles these situations and understands the risks, as well as the proper procedures to handle a water damage. If water is found in your home or basement, call SERVPRO of Plymouth / Long Lake / Medina to help you 763-557-7323. If your business suffers any form of property damage, SERVPRO of Plymouth / Long Lake / Medina helps get your business back in business. A tree can fall on the roof or flood waters can come through the front door, whatever the problem is, SERVPRO can help overcome the issue and restore operations. A fast response is definitely needed when a business is interrupted and can’t operate. Customers want products, employees need to work, and things need to be returned to normal. Not only do you need a restoration company when damage occurs but you want a company that has commercial experience. SERVPRO of Plymouth / Long Lake / Medina has the staff, equipment, and experience to effectively respond to projects involving stores, factories, hotels and other large, commercial properties. 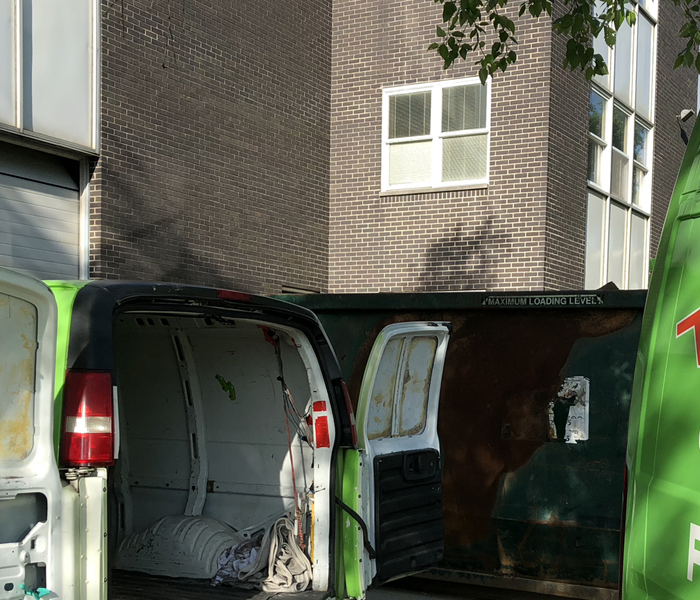 It makes a big difference to have the right company working on a large commercial restoration property, especially when customers, employees, and ultimately businesses need to be repaired and restored quickly. If your business has suffered water, fire or other property damage, count on the experience of SERVPRO of Plymouth / Long Lake / Medina to restore your property. If fire damages your property, count on SERVPRO of Plymouth / Long Lake / Medina to help you recover after the flames are out. Fires are incredibly impactful events, affecting many parts of a home or office. The destroyed and burnt smells, following a fire, SERVPRO can help you with many aspects of the recovery. The smell of smoke is one part that everyone wants to get rid of. We help with that. Walls and flooring need to be replaced. We handle that work. Personal items need to be cleaned, de-odorized and/or replaced. All things we are involved with. The burns, smells, and damage from fires will all be addressed by SERVPRO. SERVPRO has developed a plan of action on how we approach the recovery following a fire. It begins with a thorough evaluation and we make determinations based on each situation. The furniture and all personal items inside your home or office will be tested to determine what can be saved and restored and what may need to be replaced. Pretesting of damage and whether things can be saved helps determine the path to restoration. Just one of the ways that SERVPRO of Plymouth / Long Lake / Medina helps you after a fire. Summer rain quickly turned into a storm. Before long, a golf course was flooded and water rushed into the clubhouse. Water stood two feet high throughout the lower level, which houses employee dormitories, a member lounge, elevator shafts, and the country club wine cellar. Help was needed. After the storm, SERVPRO of Plymouth / Long Lake / Medina was called and went to work. The water was pumped out and unsalvageable items were removed. Mitigation teams cut the wet drywall and began drying the facility. After the property was dried, the rebuild began, with construction teams restoring the property to its original state. New drywall, flooring, and trim was installed. Soon enough, the club was back to normal and the course resumed operations. If your home or business experiences storm damage that results in flooding, water damage, or other property damage, SERVPRO of Plymouth / Long Lake / Medina can help. Property damage can happen anywhere. Fires, floods, storm damage, or other types of damage can impact homes, as well as businesses and commercial property. SERVPRO of of Plymouth / Long Lake / Medina regularly responds to water and fire damage in large, commercial buildings and businesses of all sizes. If a commercial building or business experiences any form of damage to their operation, it is imperative to get the situation under control and up and running as quickly as possible. Each day not open or operating means that people can’t work, with business interruption having a profound impact on the local economy and beyond. These are the situations when SERVPRO can help and restore damage quickly. SERVPRO of Plymouth / Long Lake / Medina responds to storm, fire, flood or other types of property damage and helps get your commercial building and/or business back up and running as quickly as possible. If a large storm has caused damage, SERVPRO of Plymouth / Long Lake / Medina can respond with one truck or the 53’ disaster trailer. Some storms can deliver more than thunder and lightning. Summertime storms can bring powerful winds, heavy rains and severe damage to property. If your property is damaged from a storm, SERVPRO can help. As 24-hour emergency restoration company that lives in the same area as you, we know when these storms happen and are prepared to respond. Summer storms usually involve water damage, water in the basement, or rain entering a building through a damaged roof or window. Aside from making sure everyone is safe (including pets), the next step is to stop any further damage from happening. SERVPRO will provide temporary closures to any open areas before beginning remediation and restoration. What does that mean? We will remove any standing water and/or debris and start drying the property. If there was damage to a roof, walls, windows or other parts of a structure, we can repair all damaged areas, from roofs to windows and carpet. 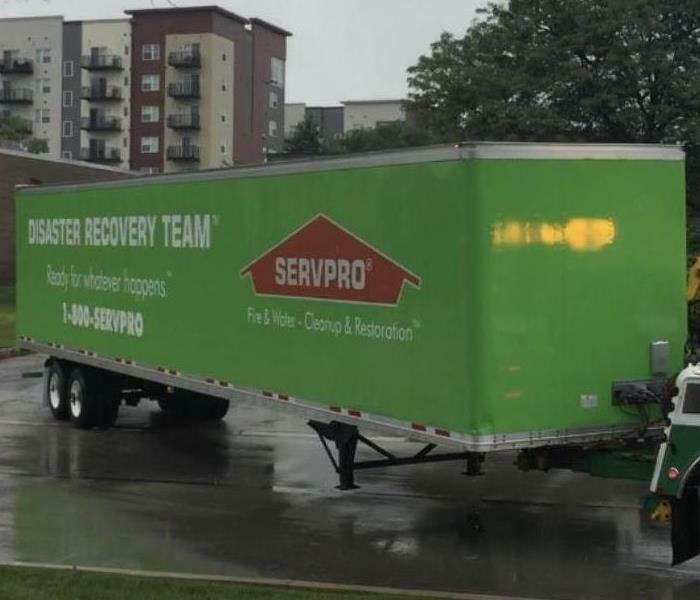 As part of the national Disaster Recovery Team, SERVPRO of Plymouth / Long Lake / Medina is fully prepared to respond in force to any size disaster, bringing all the people and equipment necessary, including our disaster trailer. If the damage affected a portion of a living room, we will respond there as well. If you have a water problem or wind has damaged your home or office, call SERVPRO. Discovering mold in your home or office can be alarming. If mold is discovered, you can contact SERVPRO for an assessment before taking any action. First things first, do not attempt to clean, scrub or disturb mold, as the spores will easily distribute into the air. If you have fans or an open window nearby blowing in the area, turn it off or eliminate any breezes. Mold spreads easily and by scrubbing it or allowing wind to reach the affected area, the spores will simply move to another area. Calling a mold remediation expert like SERVPRO will allow for a number of actions to take place. The first thing we do is find the source of the mold. There may be a leak, a water or moisture source that contributed to the mold growth. 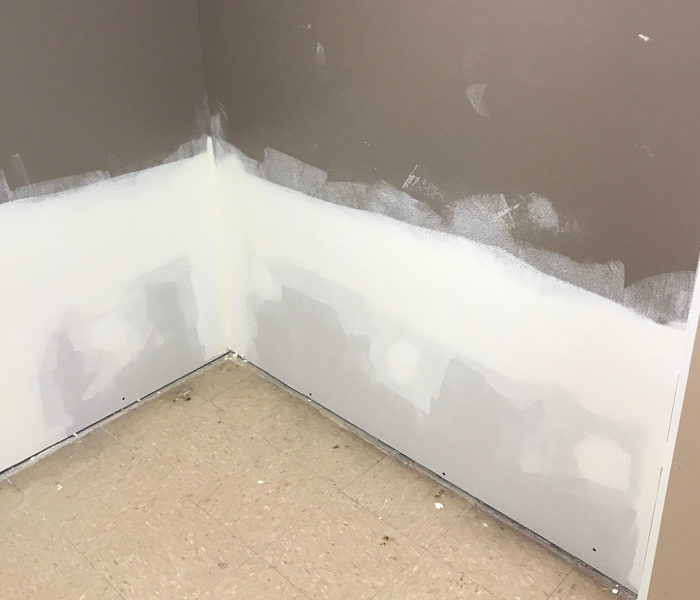 Our trained mold technicians will find the source, eliminate further damage, assess the situation, contain the existing problem and remove the mold. Also, we will professionally clean the affected areas and contents, as well as provide air filtration and provide any restoration, if needed. 10/23/2018 - Did you unpack holiday decorations and find mold? Call SERVPRO of Plymouth / Long Lake / Medina.